Friday was a busy day at the Lone Pine Film Festival! I saw five movies and also had a couple of books signed; my husband also went horseback riding thanks to McGee Creek Pack Station. He's gone on these rides a few times now and always has a great experience. There nothing quite like riding in the Alabama Hills, which are unchanged since favorite Western stars rode there decades ago. 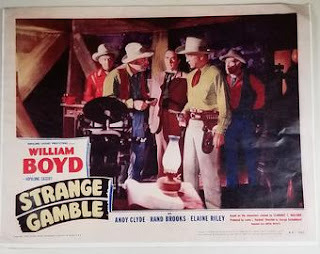 While my husband was riding I attended my first movie of the day, the Hopalong Cassidy film STRANGE GAMBLE (1948). In this entry Hoppy is investigating counterfeit currency. 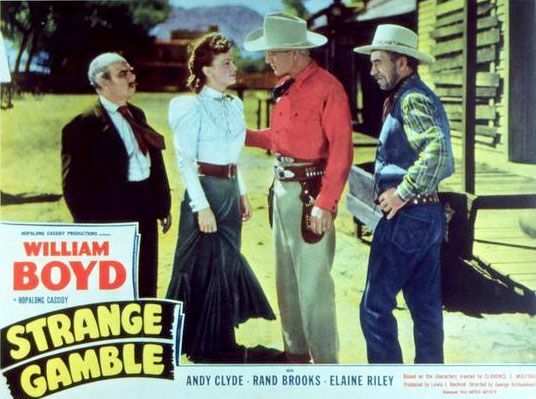 Hoppy, California (Andy Clyde), and Lucky (Rand Brooks) also become involved with a young woman, Nora (Elaine Riley), whose brother Sid (William Leicester) is murdered. The two stories come together when it's discovered that Nora's father (Herbert Rawlinson) is being held hostage and forced to produce the counterfeit money. STRANGE GAMBLE was the very last of dozens of Hopalong Cassidy films and was a solid entry in the series, with Alberto Morin standing out as a mysterious Mexican gentleman. There are a couple odd throwaway incidents, such as Nora's very ill sister-in-law (Joan Barton), who is scarcely seen and then dies off camera, but all in all I enjoyed it. Leading lady Riley appeared in four Hoppy films between 1946-48, including THE DEVIL'S PLAYGROUND (1946), which I wrote about in my recent column at Classic Movie Hub. STRANGE GAMBLE is a 61-minute film directed by George Archainbaud and filmed by Mack Stengler. 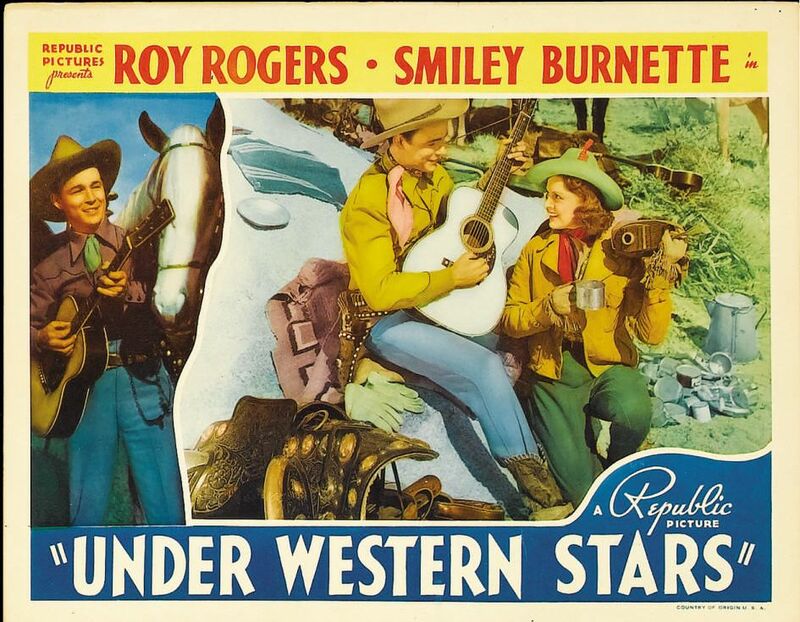 ...then back to Lone Pine High School to see a restored print of Roy Rogers' first starring feature film, UNDER WESTERN STARS (1938). UNDER WESTERN STARS runs 65 minutes and was directed by Joseph Kane, with black and white filming by Jack Marta. 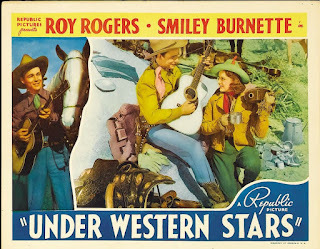 UNDER WESTERN STARS was originally planned to star Gene Autry, but Gene went on strike and Roy was given his big break. The somewhat unusual story finds Roy being elected to Congress and trying to raise awareness of the plight of Dust Bowl farmers in the Depression. The standout scene involves Roy singing a somber song by Johnny Marvin titled "Dust," which was nominated for the Academy Award as Best Song. The score also included "Listen to the Rhythm of the Range" by Marvin and Autry. 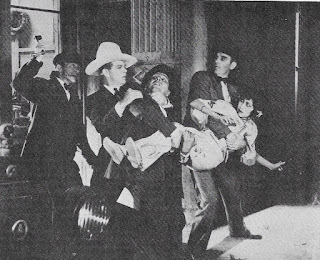 Carol Hughes was the film's leading lady, with Smiley Burnette and the Maple City Four in support. IMDb indicates this was one of future Western star George Montgomery's first films as a stuntman and extra. 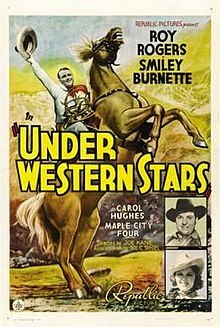 At the screening Ed Hulse interviewed Julie Rogers Pomilia, daughter of Dale Evans' son Tom, and Jay Dee Witney, son of director William Witney, who grew up knowing Joseph Kane ("Uncle Joe"), director of UNDER WESTERN STARS. Julie told some sweet stories about her grandparents; she said when she was little she thought everyone's grandparents made movies! She said what you saw onscreen was what you got with them, that they were friendly and fun to be with; she also shared that her grandfather was rather shy and when he needed to make a personal appearance he'd say "It's time to play ol' Roy!" He was very aware of a Roy Rogers public "persona" separate from real life. ...we headed for the Museum of Western Film History, where Scott Harris (left) and Wyatt McCrea (right) were signing their book 52 WEEKS: 52 WESTERN MOVIES. We had copies signed for both us and my dad! My husband called the Tom Mix silent film JUST TONY (1922) the "sleeper hit" of the festival. This 70-minute silent film was directed by Lynn F. Reynolds and filmed by Daniel B. Clark. It's the story of a cowboy who tames Tony, a remarkably talented wild horse; some of the stunts and the "acting" by the horse were quite impressive! Claire Adams provides the love interest. Fun to note that another future Western star, George O'Brien, is credited by IMDb as a production assistant. Prior to the screening of JUST TONY, Ed Hulse introduced pianist Jay C. Munns, who always does a terrific job accompanying the festival's silent movies. Live music always adds a great deal to the experience watching a silent film! After JUST TONY we popped back across the street to the museum, where Vanda Krefft, author of THE MAN WHO MADE THE MOVIES: THE METEORIC RISE AND TRAGIC FALL OF WILLIAM FOX, kindly signed my copy. I'm looking forward to reading it! 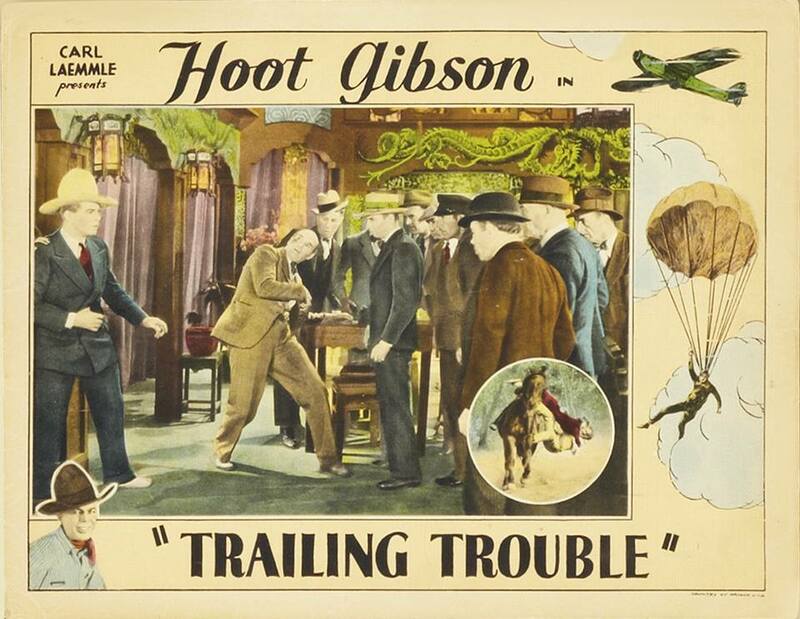 I was quite torn between hearing Krefft's talk and seeing the Hoot Gibson film TRAILING TROUBLE (1930), which were taking place at the same time. I ultimately opted for TRAILING TROUBLE, as I had enjoyed Gibson in THE TEXAS STREAK (1926) at last year's Cinecon Festival and wanted to see him in another movie. TRAILING TROUBLE proved to be a fairly goofy 58 minutes, a mildly entertaining film directed by Arthur Rosson and shot by Harry Neumann. Gibson plays Ed, who is constantly telling his girlfriend Molly (Margaret Quimby) tall tales. When Ed goes to the big city to sell cattle for his boss (William McCall), Ed becomes involved in an incident which exceeds his wildest stories as he tries to help a Chinese girl (Olive Young) and the money disappears. One of the curious things about the film was that the actors spoke in extremely stilted fashion, with the characters waiting more beats than seemed normal to respond to one another. I wondered if it had anything to do with working with the early sound equipment -- many scenes were filmed outdoors -- yet this issue was not apparent in the evening movie THE BIG TRAIL (1930), which was largely shot on location and released the very same year. Coming next: A review of Friday evening's keynote movie, THE BIG TRAIL (1930), starring John Wayne and Marguerite Churchill. Well, you and Doug clearly had a fantastic Friday at Lone Pine, Laura! Curiously, there were 66 Hoppy movies made 1935-48 and I have seen all of them, some multiple times, over my lifetime, EXCEPT "STRANGE GAMBLE" oddly. I need to pull it out for a watch. From your stills I note Boyd was not wearing his usual outfit in this one. 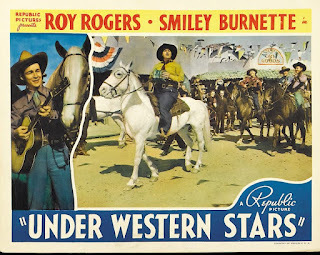 As you said, "UNDER WESTERN STARS" was designed to be Autry's next film but he went on strike for better pay so Roy got his big break. Then Gene returned to work so Roy's subsequent films 1938-41 took more action-oriented, historical-era settings. 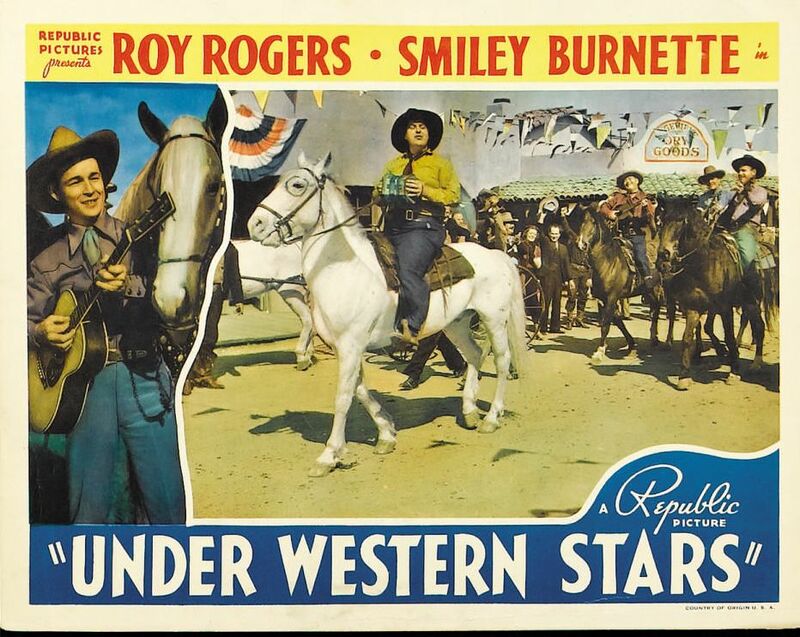 Also, of course, Smiley returned to Gene's movies and Roy was given Gabby Hayes, a very fair trade indeed! I envy you seeing "JUST TONY". I have only seen one of Mix's silents but it was terrific. Well, he WAS No.1 cowboy throughout the 20s. Hooter was big in the 20s too though he has never appealed to me so much. What a great start! Can't wait to read the next chapter. I don't believe I've ever seen a Tom Mix movie. Of course, his legend looms large and I must amend that deplorable situation soon. It was a great day, Jerry! How funny that STRANGE GAMBLE is the lone title you're missing from your Hoppy viewing. I hope you'll enjoy it! I wonder why the choice was made for Hoppy not to wear his more typical "uniform." Caftan Woman, I hope you and Jerry can both see JUST TONY. We really enjoyed it! I just learned there's a Tom Mix Museum in Oklahoma. I clearly need to get to Oklahoma one of these days as there are at least three museums I'd like to visit -- or revisit! I was in the Western museum there as a child but don't recall much about it, and I'm sure it's changed greatly since then!